Signs: Fully supported/guided by motorbikes and Mavic support cars. Why? 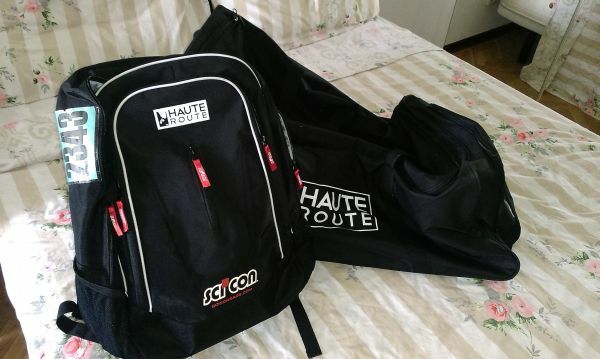 The Haute Route offers something truly unique in that it is a fully timed and ranked authorised stage race for amateurs, with a level of support normally reserved for professional riders. On top of this, the exceptionally tough timed and ranked challenge passes over some of the most beautiful and unspoilt mountains in Europe. I'd decided to do the event through official tour operator Alp Cycles. This is the fourth trip I've done with Alp Cycles and for me they offer the best cycling experiences in the Alps in terms of affordability, logistics and rider support, not to mention being a jolly good bunch. Judging by the number of repeat customers on this year's trip, they're definitely doing something right. Now more popular than ever (selling out in December 2014) this year's event was set to be the toughest ever, and for the first time run in the opposite direction, starting from Nice and finishing in Geneva. 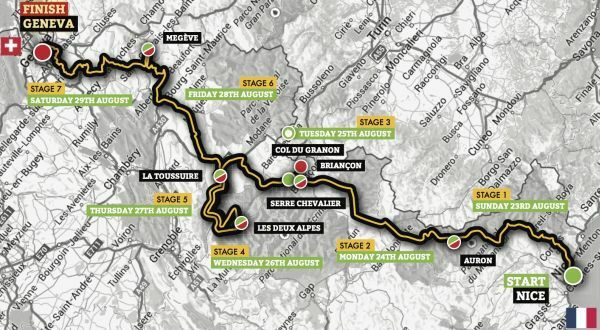 The inclusion of several new climbs and a rather unhelpful landslide in the months leading up to the event forced a course change that included even more climbing which promised to be punishing but potentially a hugely rewarding challenge. After months of newsletters and training the event came around very quickly. I arrived in Nice on a hot Friday evening a bag of nerves. I was greeted by one of the representatives from Alp Cycles and whisked off to our conveniently located hotel, near the airport, registration and start line. At the hotel I was met by Ade, one of the owners from Alp Cycles, looking worryingly lean this summer and as usual with a big grin on his face. It wasn't long before we had my bike up and running which was comforting and good to see that it had arrived in one piece. After meeting the rest of the group we had a nice dinner before registration beckoned the following day. In the lead up to the event we'd been given an official guide containing information about all three Haute Routes, as well as later a final road book with detailed information about the event which explained excellently how things would work. It also contained comprehensive information about each stage which I'd refrained from looking at in too much detail as the profiles and amount of climbing each day scared me. Registration opened at 9am and we decided to make the short journey down to the Race Village as early as possible to try and get things done quickly. On arrival the Alp Cycles stand was clearly visible and allowed us to leave our bikes as well as drink copious amounts of coffee (a theme for the week) before embarking on an impeccably organised registration system. This included a bike and helmet check before passing to the bib collection tent. 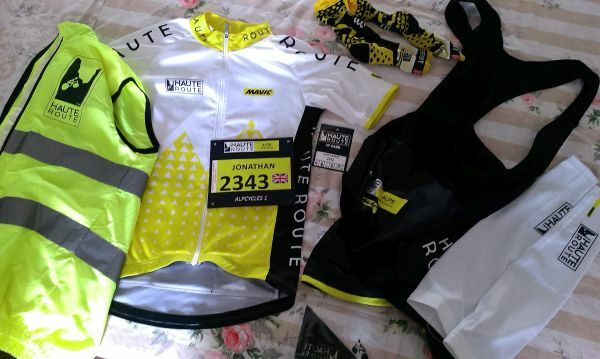 Next up was the Mavic stands to collect our official Mavic Haute Route kit (1 jersey + 1 bib short + 1 pair of arm warmers). Our last point of call was dropping off our bike boxes which the organisers would guard for the week. Thankfully Alp Cycles had ferried down our boxes from the hotel for us. 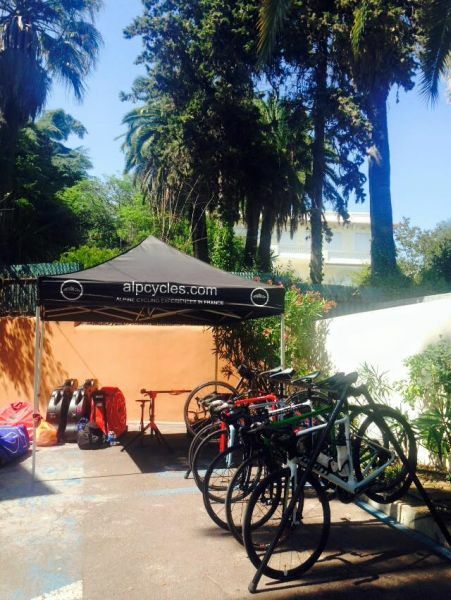 Having ridden just about every amateur event there is out there I was really impressed by the organisation of the registration and the quality of the kit and bags we were given. It really was a seamless affair and there was also the possibility to have Mavic look over any last minute rattles. The yellow team would also be on hand all week as well as providing official road side mechanical support. Some of the rest of the group took the opportunity to ride down the coast to Monaco, which I must admit sounded nice, but I decided to save my legs and opt for a quiet afternoon by the hotel swimming pool. 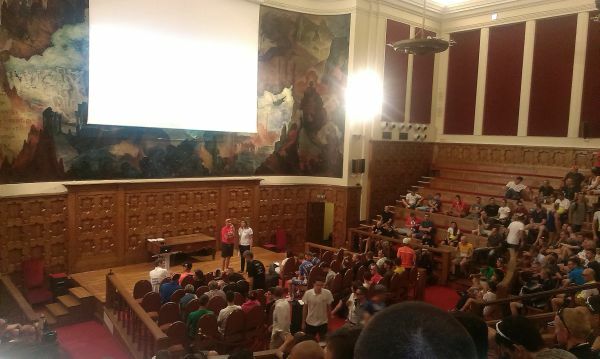 At 6pm we went to the mandatory race briefing where the race organisers went over the most important information, including automatic disqualification for those caught littering. They also took the opportunity to explain several social media services with a focus on "live" including automatic posting of official race photographs to your Facebook account and twitter notifications when you started and finished a stage. which portrays the life of Devyani's granddaughter and Naira's cousin sister, Mishti portrayed by Rhea Sharma.